The Hispanic American Construction Industry Association (HACIA) would like to congratulate Governor Pat Quinn on signing the Voluntary Reporting Goals for Utilities Bill: SB2526. HACIA backs the bill because it will require all Interstate Commerce Commission (ICC)-regulated utility companies to provide an annual report indicating procurement goals and actual spending on small businesses and enterprises owned by minorities, women and veterans. 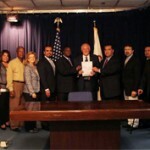 Governor Quinn signed the bill at the State of Illinois Building. Each year, ICC-regulated utilities spend billions of dollars on contractors and supplies. However, of the 52 utilities regulated by the ICC, only ten publicly state any diversity procurement and contracting initiatives. Those ten do not indicate how they are doing on meeting those goals, which will change thanks to the Bill.